Discussion in 'Downhill & Freeride' started by j-wasilenko, Jan 7, 2008. 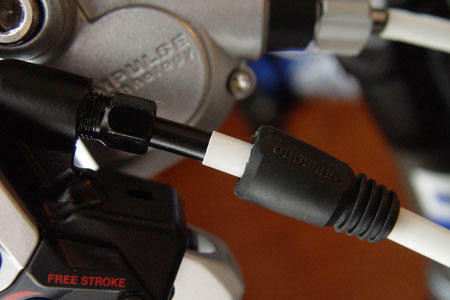 Here is a how to guide I wrote on changing normal black cables on your bike to pretty much any color you could want. Not only is black boring but the hard coating on the outside of the cables can rub through paint and even aluminum. I have seen a Hayes brake cable eat right through the stanchion on a Fox 40. Braided stainless brake lines look nice, but are expensive running over $50 a line and dont match your derailleur cable. By using the same heat shrink tubing electricians use, you can protect your frame and match your cables to any color scheme for your bike. 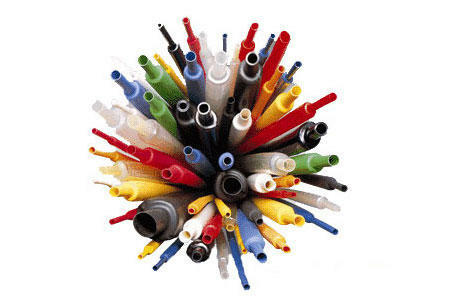 You can purchase heat shrink tubing at most specialty electrical suppliers and online. It is very cheap running about $2 for 4 feet. Most stores carry a plethora of colors; some even have UV reactive tubing that glows under a black light. Another option to use would be expandable braided sleeving for that stainless braided look. You might need more or less heat shrink tubing depending on how many cables you are doing and how long they are. 180 inches is what I needed to do front and rear brakes and full length rear derailleur housing. Best to measure your cables with a string and tape measure and then add a bit so you have some extra to play with. I recommend using brand new housing and cables for this, nothing like new derailleur housing and cables to boost the feel of your bike. For disk brake lines you can use your old lines just be sure to clean them and have new fittings on hand as detaching the line from the caliper and reattaching can generate leaks if you do not use new fittings. Now take your housing and heat shrink tubing and lay them side by side. Measure and cut the heat shrink tubing to the length needed, being sure to leave space at each end of the cable for cable ends or disc brake fittings, typically around 1-2cm per end. Try to cut the ends as square as possible so the heat shrink lies flush with the cable ends. Now you can slide the heat shrink tubing over the cable housing. If you have 3/16 tubing it will slide easily for the first 12 inches or so and get progressively harder as you have more heat shrink over the housing because of the friction. It is possible with a lot of effort to do a full length cable but I prefer to cut the heat shrink tubing in to 15 sections and slide a couple of sections on. You get no bunching this way and if you have to replace a section you can do it in a 15 length instead of the entire cable. The other option if you have access to a heat gun/soldering iron is to use ¼ tubing and shrink the tubing over the cable. The ¼ tubing will slide on easily but once you shrink it with the heat gun it won't come off unlike the 3/16 tubing where you can slide it off again and reuse it. ...but are you saying these wont cause cable rub like plain cables do? Well, heatshrink IS a softer "rubber", but it will wear through soon enough I think. great tip though. How does it stand up to DOT fluid? Nice.. 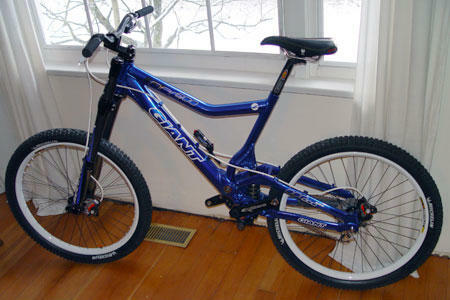 I have done that on a few of my bikes. Did not wear through the shrink at all. I got mineral oil on them but no DOT, so no input there. by the way, the stainless steel braided brake lines aren't for looks. Yeah and they don't even match your derailleur cable anyway. 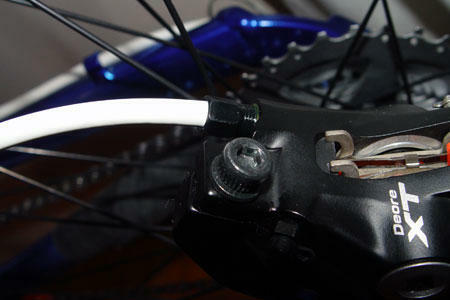 Last year I shrink wrapped my brake cable and shifter cable together to form a clean single loop on my downhill bike. 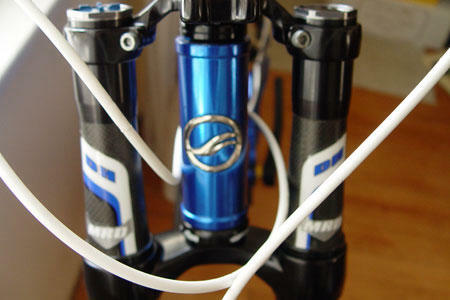 I also run Nokon cable, so it eliminated any creaking in the bends from dust or contaminants. I didnt do the full thing, but I just put it in small segments where the cable was bending or touching the frame. Makes everything super quiet, but be warned, it will still wear through paint like a normal cable. Even the softest of coating will eat through paint when you combine friction between the surfaces and then add in an abrasive like mud. Clear stickers are the way to go...clear packing tape works great if you do it right with no fingerprints. Completely invisible and cheap.. Lot of effort for some added weight. If you route your cables right you can avoid having them eat through anything important. i like colored elect. tape. run the piece with the cable and wrap from bottom up so the seam is down and in. this way you can still change housing anywhere and have your rig factory. Yes I know stainless cables aren't just for looks. Thanks for the comments guys, I want to create some more guides, been a mechanic for quite sometime now so just wondering what is lacking for guides out there for people? You can buy housing in any color you want. I prefer to buy housing based on performance first (5mm or 5.5mm compressionless in full runs), but brands like Jagwire offer some good stuff in a lot of colors. I didnt do the full thing, but I just put it in small segments where the cable was bending or touching the frame. That's exactly what I do. That with some clear vinyl applied to the frame all but eliminates wear. I also get the more "rubbery" heat shrink instead of the hard plastic type.